Most Armenians are followers of the Armenian Apostolic rite. It is called Apostolic because it is believed that the the Apostles Thaddeus and Bartholomew evangelized the Armenian people. According to tradition the Kingdom of Armenia was converted to Christianity in 301 AD. In addition to the Armenian Apostolic church there are/were Armenian Catholic communities in Turkey - One such was the village of Pirkinik near the city of Sivas. There was also a substantial Catholic Armenian Community in Pera/Beyoglu/Galata in Constantinople. 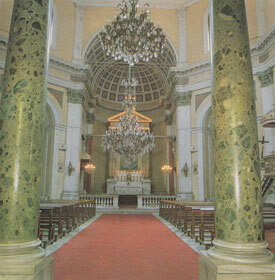 "A Catholic Armenian community formed in the early 19th century in Beyoglu through their contact with the French Levantines*, which facilitated the commercial relations with the latter and enabled the Catholic Armenians to get rich, as can be seen through the imposing buildings rising all along the avenue. One of them was Abraham who got the title of Pasha and to whom belonged the building inside which was opened the "Cercle d'Orient", the poshest club of the time, located before Halep Pasaji (Cite d'Alep)." * Levantines were Europeans who lived in Turkey, some from the times of the Crusades although the majority were descendants of traders from the maritime republics of the Mediterranean. The lived mostly in the "European" sections of the city like Galata and Beyoğlu. Ottoman authorities tended to favor Armenian Catholics because of their connections to Europe, particularly France and the Vatican, whom the Ottoman empire wanted to please. 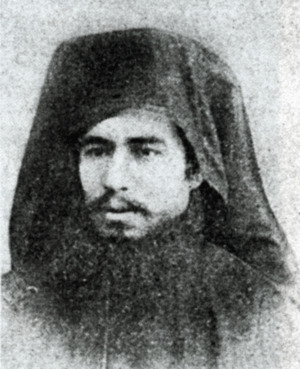 Abraham Azarian married Ezisabet Hagopian on May 25, 1895 in Surp Savour. Christine was baptized March 28, 1899 in Holy Trinity Church. Melcon was baptized March 17, 1901 in Surp Savour. Zabel was baptized October 5, 1903 in Surp Ohannes (Hovhan) Vosgeperan. Anna was baptized May 18, 1908 in Surp Savour . Mary was baptized _____ 21 1910 in Surp Savour. Alice was baptized December 27, 1914 in Surp Savour. 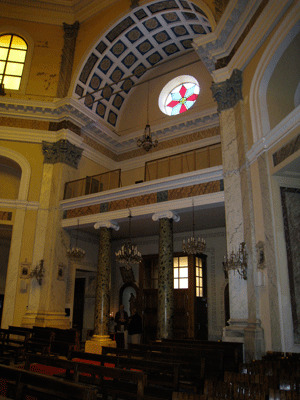 On a trip to Istanbul in 2005 Eileen and Ron Claveloux tried to locate the three churches connected to the Azarian family. They did not find the churches, however, Eileen brought back a map that helped me to specifically locate the church of St Savior. The map was also helpful in narrowing down the locations of the two other churches. In the meantime I bought L'Eglise Armenienne Catholique en Turqui (alas, in French which I cannot read) about the Armenian Catholic Churches in Istanbul. While it does not contain any addresses it did enable me to determine the various "names" of St. Savior, St. John Chrisostomus and Holy Trinity in French and Turkish and this facilitated finding listings for them on the Internet. Levon Çapan and his wife, Ani, are Armenians born in Istanbul. They very generously gave me Istanbul Ermeni Kiliseleri (Armenian Churches of Istanbul) by Pars Tuglaci (1991).This book deals mainly with the Armenian Apostolic churches in Istanbul. 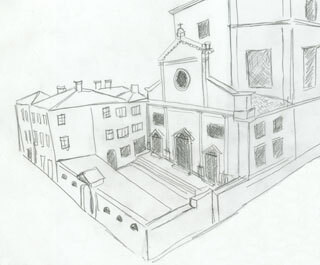 There is, however, a section on the Armenian Catholic Churches. Pars Tuglaci says there are 12 Armenian Catholic Churches in Istanbul. 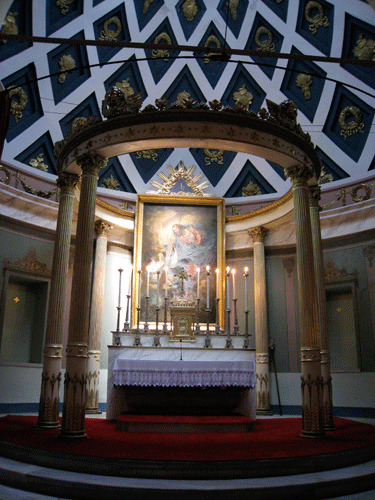 The oldest was Saint Jesus the Saviour founded in 1832. Using these bits of information and the fabulous Google Earth I was finally able to locate the three churches. In May 2008 Tom and I visited Turkey for a week. We spent five days in Istanbul and we could not have had a more fabulous adventure. We were blessed to have the Çapan brothers, Levon and Koko as our guides and translators. Levon is a colleague of my husband, Tom. His brother Koko is a funeral director in Istanbul. Koko's place of business is, in fact, right next door to the church of Surp Hovan Vosgeperan. Not only did they take us around to the three churches that were connected to the Azarians, but they took us to the Armenian Catholic Cemetery in Sisli and showed us the Azarian mausoleum and the Pirkinik plot. (Having a funeral director as your guide to a cemetery helps a lot.) In addition, Koko and Levon arranged an audience with the Armenian Catholic Archbishop, Hovhannes Çolakyan, at the Catholic Armenian Patriarch Building. We were able to visit the interiors of Surp Hisus Pirgic (Holy Savior) and Surp Hovan Vosgeperan (Saint John Chrypostoma), but it appears that Surp Yerrortutyun (Holy Trinity) has been closed for some time. Foreign missionaries in Turkey and Iran tried to convert members of the Apostolic Church to Roman Catholicism as early as 1630. One of the areas where they had some success in these conversion attempts was in Sivas. However, the Armenian Catholic church was not recognized until 1830 when Sultan Mahmed II issued a "firman" (royal decree) on January 6, declaring the Catholic Armenians a separate "millet" (a non-Muslim group or community in Turkey organized under a religious head of its own who exercises civil functions of importance [Webster]). Stephan Azarian was the Armenian Catholic Patriarch from 1881 to 1889. He died in May 1899. I do not know if he was related to Abraham Azarian. The maps that Tuglaci includes indicate that the Armenian Apostolic community was spread throughout the city and the Armenian Catholic community was concentrated in the "European" section of Beyoghlu, which included the subsection of Galata and Karakoy. 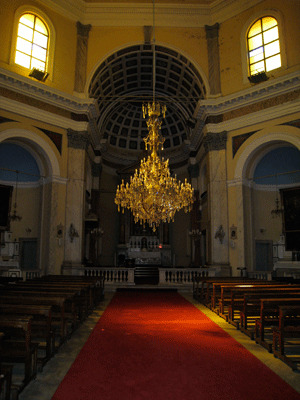 Saint-Marie (cathedrale), rue Agha Djami, Pera. M r l'abbe Stepan Apikian, Cure et superieur. 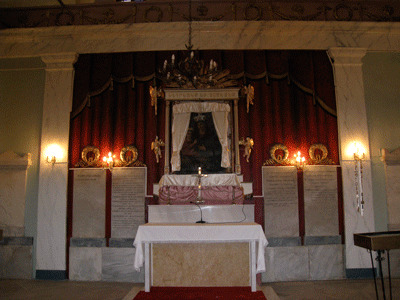 The Patriarch of the Armenian Catholic Church of Cilicie was Etienne Pierre X Azarian. His address was given as rue Sakyz Aghatch, 31, Pera. The Armenian Catholic Cemetery was at Chichli, The chaplain was Athanase. 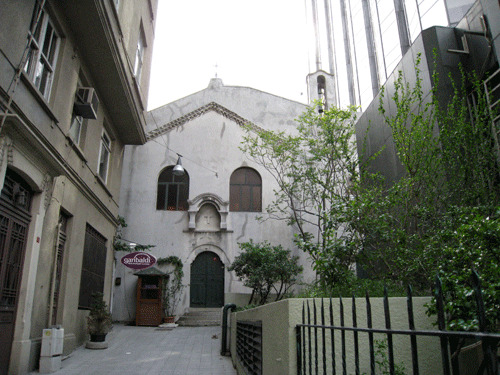 Surp Hisus Pirgiç Church was the first Armenian Catholic church in Istanbul. Built in 1834 with the permission of Sultan Mahmut II it served as the patriarchal seat from 1850 up to 1928, when the Patriarch moved to Beirut. 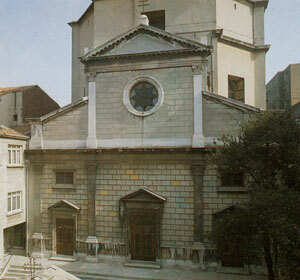 In 1928 the headquarters of the diocese of Istanbul moved to the Armenian Cathedral (St Mary, Surp Azdvadzadzin) on Sakizagaci off Istakal Cadessi in Pera/Beyoglu. 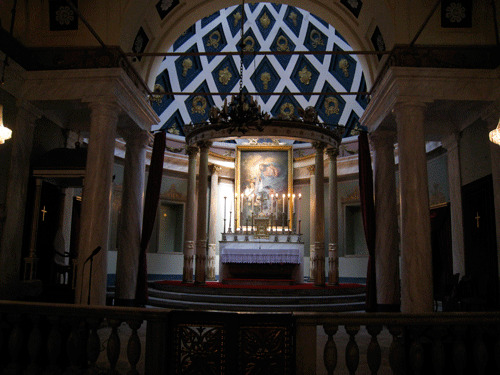 Up until 1834, Armenian Catholics attended the church French Church of St Benedict, where masses were said in French, Greek, Armenian and Turkish. 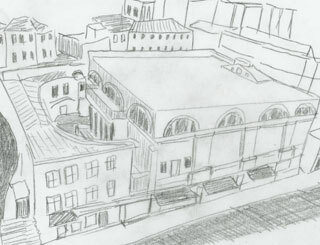 The side of the building is on Kemeralti Cadessi with shops on the ground floor. The entrance is via a small courtyard on the west side. The church has no particular style. It has recently been restored. Holy Saviour (Saint Jesus the Savior) is the church at which Abram and Lucy were married in 1895, Catherine was baptized in 1896, Melcon was baptized in 1901, Anna was baptized in 1908, Mary was baptized in 1910 and Alice was baptized in 1914. "In the gloomiest part of Galata accessible only though damp and sinuous lanes, stands the Armenian Catholic church of the Holy Savior. It is the least uninteresting of the churches held by those Armenians who have forsaken their national religion and accepted the supremacy of Rome. Its chief distinction is derived from the possession of a tomb, on which the epitaph in Latin many be read: "Here lies the body of Emi Beshir Sahibi, for fifty-six years the pacifier of Lebanon. Loved of God and man, he was taken to heaven on December 30, 1850". The name of the dead emir now awakens hardly a vague recollection. Yet little over fifty years ago, it agitated all the courts of Europe, and the stately autocrat who bore it held the destinies of empires in his hands. At last he was betrayed to the allied English and Austrians who surrendered him to the Ottomans. He was kindly treated by the latter, though under constant watch. Ten years later, he who had trod the slopes of Lebanon as a king died in captivity in Kadi Keni." This icon of the Virgin is credited with stopping a plague. 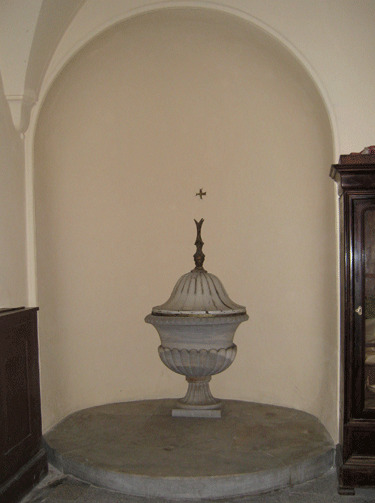 Baptismal fount. We were assured that this was the original font and was the one used at the baptisms of the Azarian children: Catherine (1896), Melcon (1901), Anna (1908), Mary (1910) and Alice (1914). Eglise Sainte Trinite in French and Aya Triada Ermeni Katolik Kilisese or Surp Yerrortutyun in Turkish. Holy Trinity Surp Yerrortutyun (Uchoran) Kilisesi was built in 1770. It is not known when it came under the jurisdiction of the Armenian Catholic Patriarch. 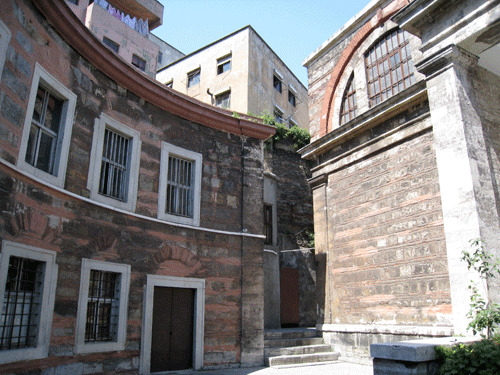 The church is up a small alley called Perukar Çikmazi (the wig maker's alley) off Istalkal Caddesi (Odakule Yani). It is tucked next to the the 22 story glass high rise office building known as Odakule Center built in 1972. "At the next corner we come to a cul-de-sac call Perukar Cikmazi "the Dead-End of the Wig-Maker." 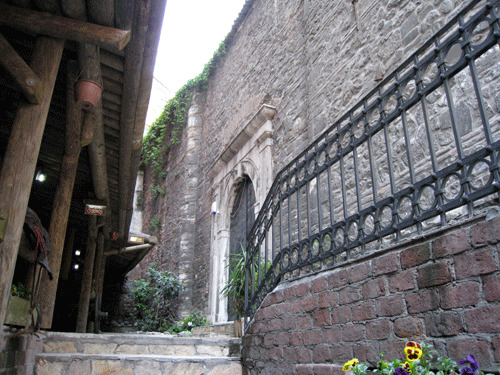 At the inner end of the cul-de-sac we see the Armenian Catholic church of Surp Yeratutyun (Holy Trinity). The first church here was a wooden structure built by the Armenian Catholic community in 1699. 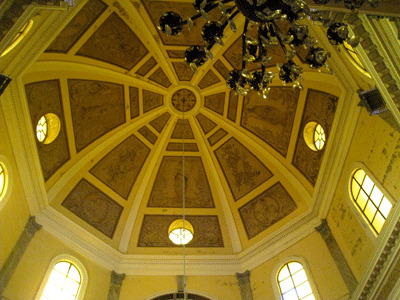 The church was destroyed by fire in 1762 and was rebuilt as a masonry structure in 1774. During the years 1852-54 the building was used to house high-ranking Catholic officials, and for a time it was also used as a church by the Austrian community. When Napoleon III visited Istanbul in 1855 he persuaded Sultan Abdul Aziz to give the church back to the Armenian Catholic community, who still retain possession of it." This is the church in which Christine Azarian was baptized in 1899. Eglise Saint-Jean le Precurseur in French and Surp Hovan Vosgeperan (or Voskeperan) Ermeni Katolik Kilisese in Turkish, is listed in Kulluoglu/Taxim at Ana Cesme Sok 4. 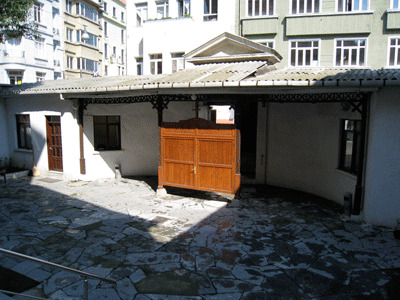 Ana Cesme Sok is located near Taksim Square behind the French Consulate. From Istiklal Caddesi take Zambok Sok to Ana Cesmesi Sok. Surp Hovhan Vosgeperan was opened in 1863. This is the church in which Zabel Azarian was baptized in 1903 and Virginia Azarian was baptized in 1905. Why Did The Rites In The Azarian Family Take Place In Three Different Churches? I have no real idea how the Armenian community in Istanbul functioned. However, based on on other communities I have researched in Europe and America rites were usually performed in the local congregation. 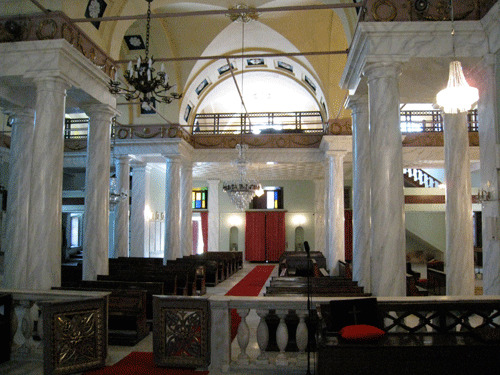 Therefore, it is possible that the changes in churches reflect changes of address for the Azarian family in Constantinople in the late 1800s and early 1900s. I do not know if the Azarian family attended church regularly when they first arrived in the US from Turkey. According to her prayer book Mary Azarian made her communion in St Anthony's Church at 8th Street and Berginline Ave., Union City in 1924. A family photo shows both Mary and Alice in First Communion attire so I assume they made their First Communion together. See Abram - photos at bottom of that page. In 1896* the Rev. 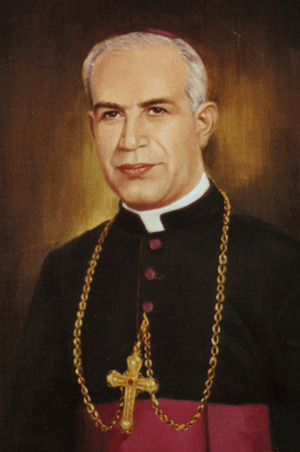 Mardiros Megerian (Mighirian/Migherian) was sent by the Catholic Patriarch, Stephen Peter Azarian, to administer to the needs of the Armenian Catholics in the US. Several Internet sites say the Rev. Megerian first went to Boston and then went to New York City. According to his naturalization papers Mardiros Mighigian was born in Damascus "Turkey" on July 6, 1854. I did not find an immigration record. On his Petition for Naturalization in the Supreme Court of the City of New York Rev. Mighirian stated that he had arrived in the US on May 1, 1899 on the Touraine from Harve, France. He was listed in the 1910 and 1920 censuses on East 29th street, RC Clergyman, born in Turkey. Several other RC clergymen were listed at the same address in both censuses. Some of these clergymen, including the Rev. Megerian, were part of the New York Apostolate a "diocesan missionary band"** headquartered at St. Stephen's Church on 28th Street near Lexington. These priests ministered to Catholic groups that were too small or two poor to establish their own congregations. According to the Catholic Encyclopedia (1912) a large number of Armenians lived near St Stephen's Church. "Msgr. Megerian was nominated Patriarchal Vicar for the United States, and he faithfully served in this capacity until 1921, helping immigrants and survivors of the Armenian genocide (1915-1921) who took refuge in this country"
The Rev. Mighirian became a US citizen on December 21, 1925. Mardiros Megerian died in New York City July 6, 1928, his 74th birthday (according to his naturalization papers). In reference to the immigration of Christine Azarian circa 1920/1921 her daughter, Ilda wrote: "The clergy at the Armenian church in New York vouched for her and this allowed her to get out of Ellis Island." Was the clergyman in question Mardiros Megerian? Pascal Maldjian was born January 10, 1886** in Marash**, Turkey. Pascal Maldjian age 35, clergyman, speaker of French, Italian, and Armenian, arrived in the US on the Paris on August 13, 1921. His last residence had been "Beyrouth, Syria". His nearest relative in Turkey was listed as Takouki Maldjian of Marache, Cilicia. His nearest relative in the US was listed as his niece, Mrs. Cirkinian at 317 E 27th Street, NYC. He was listed as born in Marche Armenia.
" Monsignor Pascal Maljain is in residence at Our Lady of Loreto, Manhattan but on principal feasts he offers his Mass at St Stephen's Eest 29th Street. According to his Declaration of Intention to become a US citizen, which was filed in January 1924, he immigrated to the United States from Havre, France on the Paris on August 15, 1921. His address in 1923 was 161 E. 28th Street: occupation clergyman. Witnesses to his petition were Madiros Mighirian, clergyman, 143 E 29th Street and Alousious C Dineen, clergyman, 142 E 29th Street. Pascal Maljian became a US citizen on June 20, 1927. Pascal Maldjian age 43, clergyman born Armenia pastor of Armenian church was listed at 161 East 28th Street in the 1930 census. Listed with him was his sister, Takouhie age 58. Pascal Maljian of 303 Elizabeth Street, New York a US citizen returned from Hamilton, Bermuda to New York's Idlewild Airport on June 27, 1951. Pascal Maljian returned from London, England to New York on February 10, 1952. Pascal Maljian born 10 January 1886 died June 1976 in the Bronx (SSDI). In 1909 the Rev. 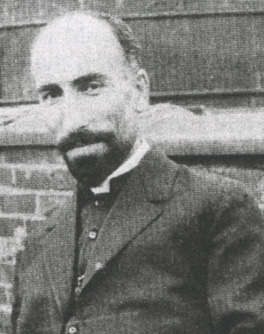 Manuel J Bazirganian was sent to Paterson, New Jersey to minister to the Armenian Catholic population in the area. He "served the spiritual needs of his people in various chapels of the city." [FLAME, page 25] The Rev. Bazirganian died in 1922 and was replaced in 1925 by the Rev. Peter Howassabian. A congregation was founded in October 1925 by the Rev. Howassabian and for two years it met in the basement of St. Michael's in Paterson. Sacred Heart Armenian Catholic church was opened the spring of 1928. Sacred Heard was relocated to in Little Falls, New Jersey in 1991. Sacred Heart was the only Armenian Catholic church listed by Armenian Catholic Eparchy of Our Lady of Nareg USA and Canada in the New York area in the 1920s and 30s. St Ann's on 12th Street in the East Village was built about 1847 as a Baptist church and was briefly used as a Jewish temple before becoming St. Ann's Roman Catholic Church in 1871. 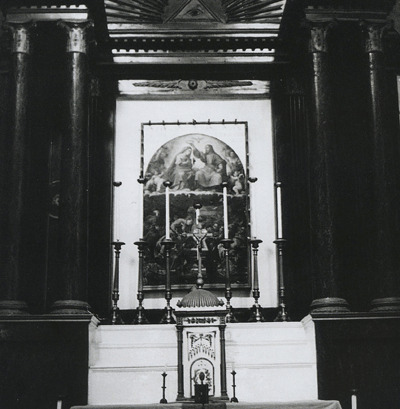 The Armenian Catholics were given use of the church by Cardinal Cooke in 1983. The church closed in February 2004. We have two churches in the metro area, the cathedral (St. Ann's Armenian Catholic Cathedral) is in Williamsburg section of Brooklyn, whereas Holy Cross Armenian Catholic Church is in Little Falls, NJ. The Armenian Catholic Eparchy for the USA and Canada has also churches in Belmont, MA., Philadelphia, PA., Detroit, MI., Glendale and Los Angeles, CA, Montreal and Toronto." St Ann's Armenian Catholic Cathedral is located at 167 North Sixth Street, in the Williamsbrug section of Brooklyn (It was formerly the church of St Vincent de Paul). Phone 718-388-4218. High Mass Sunday 11:00. St. Ann's Cathedral, Brooklyn - rector, Rev. Antoine Noradounghian. Sacred Heart, Little Falls, New Jersey - pastor, Rev. George Kalousieh. St. Mark's, Philadelphia, PA. - pastor, Rev. Armenag Bedrossian. Holy Cross, Boston, Massachusetts - pastor, Very Rev. Raphael Andonian. St. Vartan, Detroit, Michigan - pastor, Rev. Thomas Garabedian. Our Lady Queen of Martyrs, Los Angeles, California - pastor, Rev. Antoine Panossian. St. Gregory the Illuminator, Glendale, California - pastor, Rev. Antoine Saroyan. Notre Dame de Nareg, Montreal, Canada - pastor, Very Rev. Georges Zabarian. St. Gregory the Illuminator, Toronto, Canada - pastor, Very Rev. Elias Kiredjian. 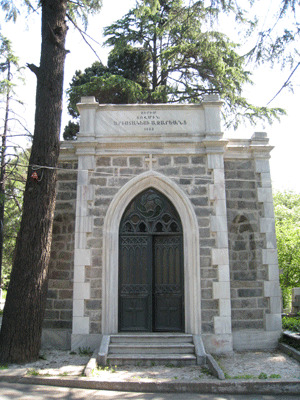 The entrance to the Armenian Catholic Cemetery in Sisli on Sisli Buyukdere Cadessi just above the Sisli Subway stop. As a result of the great cholera epidemic of 1865 the government forbid burials inside the city. Before that date the Armenians who lived in Beyoglu had been buried in either the Pangalti Armenian Cemetery near Taksim (1560-1865) or the Roman Catholic Cemetery on the site of the present Taksim Park. Following 1865 the Armenian Catholics had their own cemetery in Sisli. 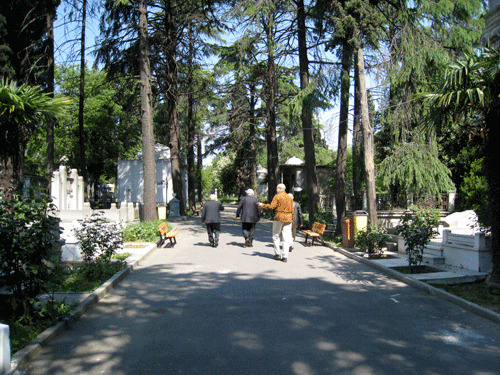 The cemetery records indicate that 5,483 people were buried in the Sisli Catholic Armenian Cemetery between 1897 and 1929. An Azarian "cenotaph" (a monument in honor of a person or persons buried elsewhere), no date. This is the main entrance driveway into the cemetery. The Armenian Catholic Cemetery in Sicli contains a section set aside the deceased from the village of Pirkinik (Sivas) . Hosef Arevian born 1832, his son, Batist, and grandson, Hozef, were buried in this section of the cemetery. I believe that Hosef Arevian was either the father or step-father of Lucy Arevian/Hagopian. Batist was definitely related to Lucy Arevian Azarian. 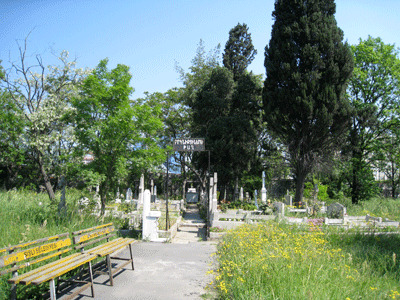 The Pirkinik section of the Armenian Catholic Cemetery, Istanbul. 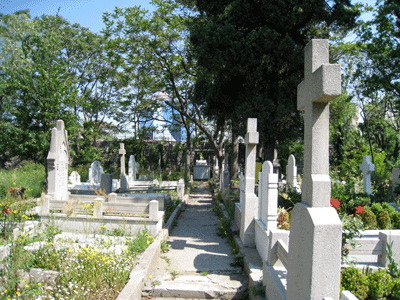 Another view of the Pirkinik section of the Armenian Catholic Cemetery, Istanbul. 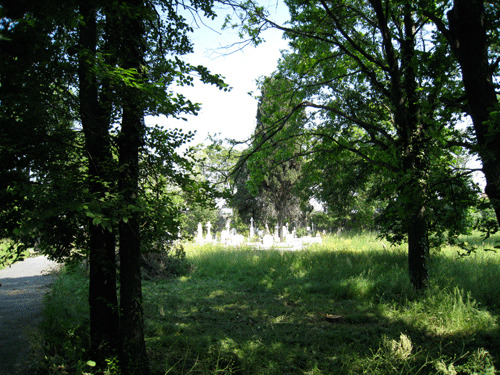 The Arevian tombstone is the first one on the right side of the photo. Azarian Mausoleum Armenian Catholic Cemetery, Istanbul. The name on the front is Arisdages Azarian, 1883. 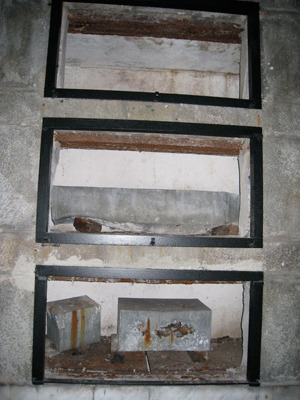 Other plaques where lying in a pile outside in back of the building. I quick search did not reveal any further inscribed stones. * ??? The filler which highlighted the information on the deceased has been removed from the stone so only the faint outline of the letters remain, making it very hard to read the names. In May 2008 Levan and Koko Çapan arranged for Tom and I to have an audience with the Armenian Catholic Archbishop Hovhannes Çolakyan. The Archbishop told us that some very wealthy Azarian brothers were very influential in Constantinople in the late 1800s. They were Armenian Catholics and were major contributers to the church. One of the brothers, Stepanos Petros Azarian, became the Patriarch of the Armenian Catholic Church. Archbishop Çolakyan believed that the family was from Perkinik. Archbishop Çolakyan has written two books on the Armenian Catholic community of Constantinople/Istanbul: L'Eglise Armenienne Catholique en Turquie (The Armenian Catholic Churches in Turkey) and Tarihi Surp Agop Hastanemizin Dünü ve Bugünü (The Past and the Present of our historical St. James Hospital*). I actually had a copy of the L'Eglise Armenienne Catholique en Turquie which I bought on the Internet before going to Turkey. The Archbishop gave me a copy of Tarihi Surp Agop Hastanemizin Dünü ve Bugünü which, unfortunately for me, is in Armenian and Turkish. *Thanks to Onan Akalin who corrected my spelling of Tarihi Surp Agop Hastanemizin Dünü ve Bugünü (which I had mangled a bit) and for providing the translation of same, March 2009. "The Catholic Armenians number 80,000*. They are mostly in Constantinople and in the larger towns in Turkey. This small community comprises the wealthiest and most respected families among the Armenians. It is a remnant of that portion of the Church which broke off and remained faithful to Rome when the great body of Armenians denounced the convention signed in Erzeroum and re-asserted the independence of their Church. ** "
Cox says that the Armenian Catholic rites preserved much of the Gregorian form of worship and was "administered quite independently of Rome". Armenian Catholicism was recognized by the Turkish government in 1832. "After this time they had churches of their own". Before this time rites of baptism, marriage and burial were performed by Apostolic (Gregorian) priests. In 1887 the head or Patriarch of the Armenian Catholic Church in Turkey was Monseigneur Azarian, a "highly distinguished prelate" and a member of one of the "most noted Armenian families". 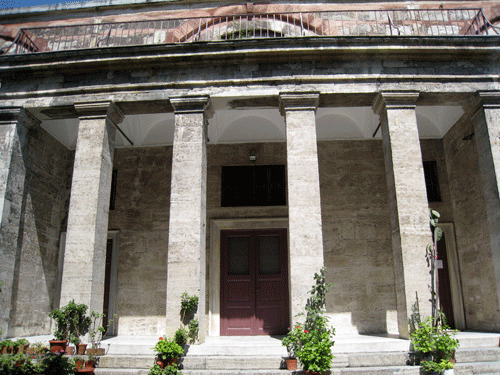 "The well-known convent of St. Lazare, in Venice, belongs to the Armenian Catholic community. It is inhabited by the order of Mectarist monks. It is thus called after its founder, Mectar, who died in A. d. 1740. From this convent missionaries used formerly to be sent into Armenia to make proselytes. Their efforts met with such determined resistance, on the part of the Gregorians, that the movement was given up. Since that time the Mectarist monks have turned their whole attention to the development of Armenian literature." * As compared to an estimated 3,725,000 Gregorian Armenians.